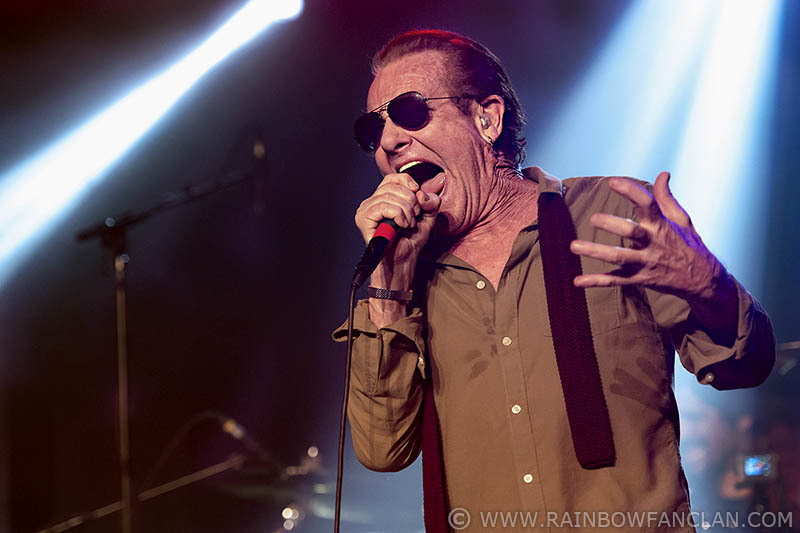 Graham Bonnet had after his Rainbow and Michael Schenker Group days quite some success with his own band Alcatrazz in the early eighties. It was the breakthrough for new guitar heroes like Yngwie Malmsteen and Steve Vai. After Alcatrazz felt apart in 1986, Bonnet continued to collaborate with many guitar heroes like Bob Kulick, Chris Impellitteri, Ian Ashley Hersey, Taz Taylor and Dario Mollo. In 2006 he tried again with Alcatrazz. This time with guitarist Howie Simon. 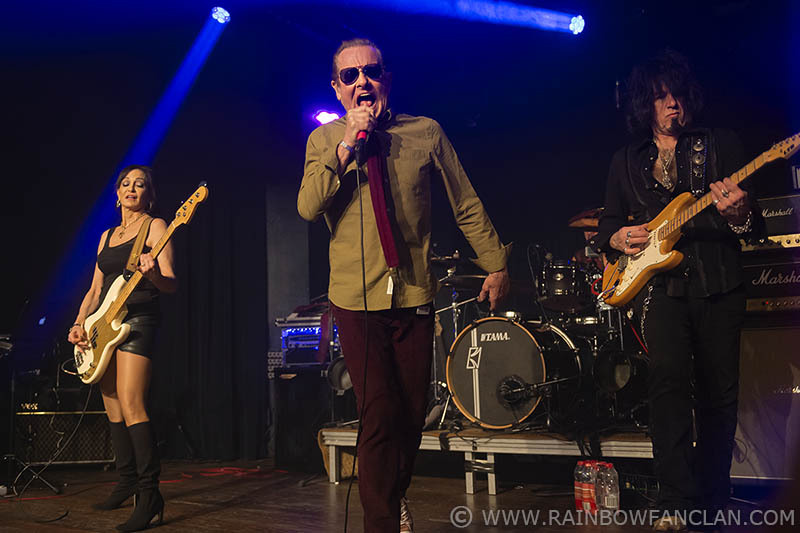 After a few years of struggling in the margins, he continued with the Graham Bonnet Band some five years ago. New guitarplayers were coming and going. Conrado Pesinato stayed a few years but was replaced more recently by Joey Tafolla and a little later Kurt James took over. 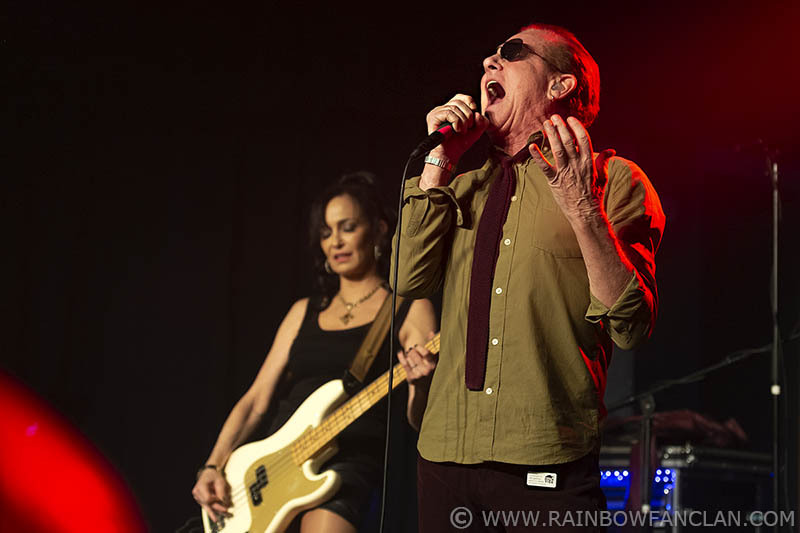 The current tour was initially also booked as the Graham Bonnet Band. After hiring another new guitar hero in the person of Joe Stump last month however Alcatrazz was brought back alive again. So the small European Tour with concerts in Finland, The Netherlands, Belgium and Germany is the first fact for the new reborn Alcatrazz. Plans are to recorded a double live album on the Japan Tour late May. The live album will feature the entire Alcatrazz "No Parole From Rock And Roll" album and the entire Rainbow "Down To Earth" album. Plus rarely performed tracks from Bonnet's days with Impellitteri and Blackthorne. In Europe Alcatrazz warms up with a smaller example of the plans to come because not the entire albums got played here. Still with 7 tracks of "No Parole" and 4 of "Down To Earth" we got a fair idea of what to expect. With 3 tracks of Schenker's "Assault Attack" plus tracks of Blackthorne, Impellitteri, his latest album "Meanwhile, Back In The Garage" and his solo hit "Night Games" the fans got enough value for their money though. In the current Alcatrazz we see apart from Graham Bonnet and Joe Stump also the original Alcatrazz keyboard player Jimmy Waldo, bass player Beth-Ami Heavenstone and drummer Mark Benquechea. 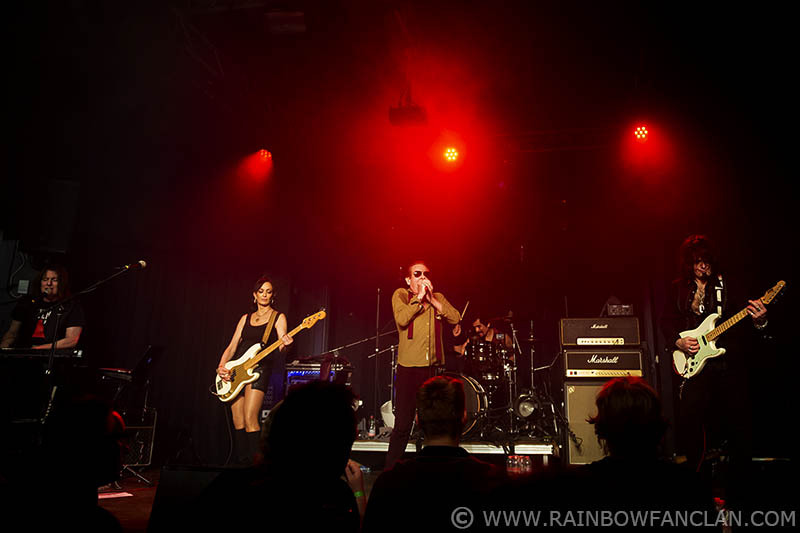 The five seems to enjoy themselves on the stage of Manifesto in Hoorn, a small venue in the North of The Netherlands. The venue is slightly more than half filled. Despite his track record, it seems for old Graham he is unable to attract enough fans to sell out even small venues in Europe. 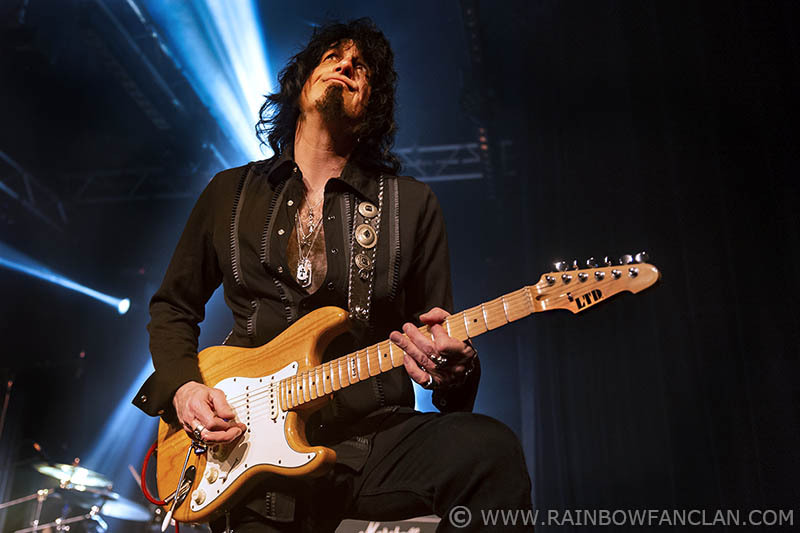 Still for the fans who have taken the trouble to come to Hoorn tonight it is a fine party with many hits from his days in the past with Rainbow, Michael Schenker Group and of course Alcatrazz. Stump who still looks like he just stepped in from the 80s hair metal era is also called the Shred Lord. He is a fine guitarplayer in the tradition of Ritchie Blackmore and Yngwie Malmsteen. He shows that he manages all the guitarwork as well as the moves and tricks of his great examples. He shows off on his guitar sometimes a bit too much. Good enough to deliver some nice grimaces on the face of Bonnet. Bonnet may have passed the seventy, but his passion and enthusiasm are no less. Although he has to squeeze it out of his toes at times. With good old Jimmy Waldo, bassplayer Beth-Ami Heavenstone and drummer Mark Benquechea the band really rocks again. The band starts with three Alcatrazz classics; 'Too Young to Die, Too Drunk to Live', 'Hiroshima Mon Amour' and 'Jet to Jet'. More Alcatrazz songs will follow later, all from the debut album 'No Parole from Rock' n 'Roll'. Of course 'Since You Been Gone' and 'All Night Long' are performed from Rainbow's 'Down To Earth', also 'Love's No Friend'. Some great songs from his illustrious past with Michael Schenker ('Desert Song' and 'Rock You to the Ground'), Impellitteri ('Stand in Line' and 'Tonight I Fly') and Blackthorne ('We Won’t Be Forgotten') follow. We also get 'Night Games' and 'Long Island Tea' (from 'Meanwhile, Back In The Garage'). Alcatrazz ends the evening with Assault Attack (Michael Schenker Group) and Lost in Hollywood (Rainbow). And that's it, after an hour and a half it is over because there is no encore.